Our Curriculum - Listen to our Songs!! Music Together® has developed nine non-sequential song collections, each characterized by its own graphic, colour, and instrument. These collections each include a recording and songbook and are designed to be used one collection per semester. The collections are not sequential. A family can begin Music Together classes at any time with any collection. Each semester introduces a new collection—including CD & songbook—so families can begin Music Together classes at any time with any collection. 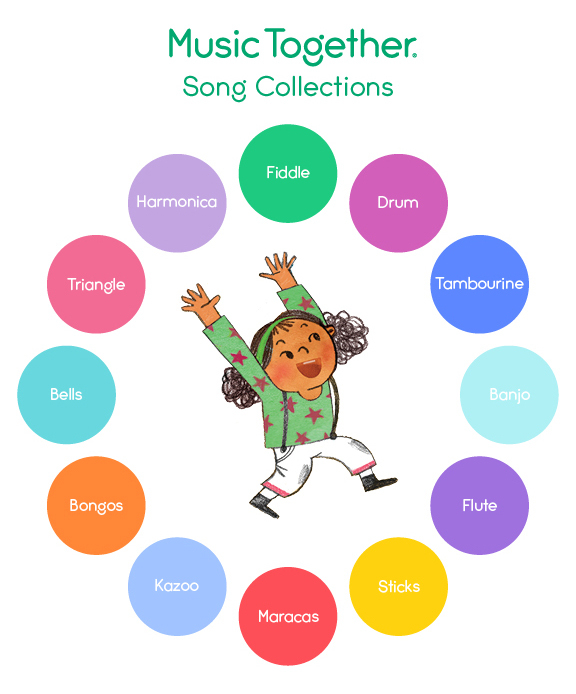 The music is pitched in just the right range for children’s voices and includes songs, rhythmic chants, tonal and rhythm patterns, and instrumental play-alongs, all in a rich variety of tonalities and meters. Original songs and arrangements by the program coauthors make these collections especially unique. Outstanding instrumentalists play a variety of instruments, such as guitar, bass, flutes, keyboards, and percussion. And all of the songs are suitable for mixed-age groups, perfect for families with children of different ages. Music Together’s song collections are research-based and artistically conceived and produced. They are also classroom and family-tested. Since 1987, the feedback of hundreds of teachers and thousands of families has been incorporated into these constantly evolving materials. NOTE: AS OF FALL 2018 THE SONGBOOKS AND ILLUSTRATIONS WILL BE COMPLETELY REDESIGNED WITH GORGEOUS NEW ARTWORK! Listen to some of our favourite Music Together!